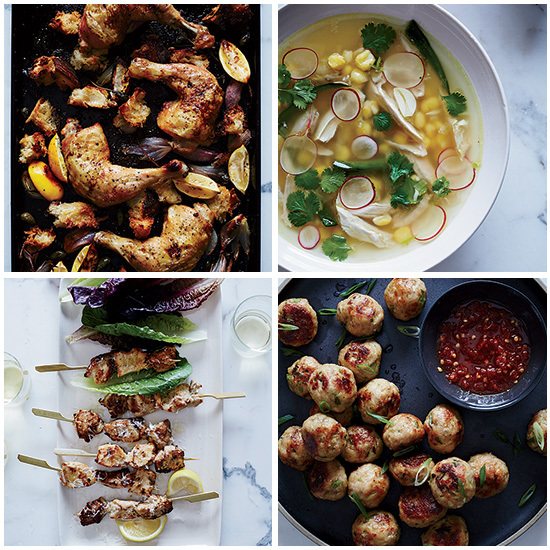 Here are four easy and healthy chicken recipes by F&W's Justin Chapple. In a saucepan, heat 3 tablespoon olive oil. Add 2 sliced poblanos, 1 chopped onion, 2 sliced garlic cloves and 1 1/2 teaspoon ground coriander; season with salt. Cook over moderate heat until the chiles are softened, 8 minutes. Add 2 quarts chicken stock; bring to a boil. Add 4 cups shredded cooked chicken and two 15-oz. cans rinsed and drained hominy and simmer for 5 minutes. Season with salt. Serve with cilantro, radishes and lime wedges. On a baking sheet, toss 1/2 pound torn sourdough bread with 4 large quartered shallots, 3/4 cup drained caperberries, 2 quartered lemons and 1/4 cup olive oil. Top with four 12-ounce whole chicken legs; season with salt and pepper. Roast at 400° for 50 minutes. In a bowl, whisk 1/2 cup mayonnaise and 1 minced garlic clove with 1 tablespoon each Dijon mustard, olive oil and minced anchovies. Add 2 pounds boneless chicken thighs cut into 1-inch pieces; let stand for 20 minutes. Thread the chicken onto skewers; arrange on a baking sheet. Broil for 8 to 10 minutes. In a bowl, mix 1 pound ground chicken, 1/2 cup plain bread crumbs, 1/3 cup minced scallions, 3 tablespoon minced ginger, 1 egg, 2 minced garlic cloves, 2 teaspoon toasted sesame oil, 2 teaspoon soy sauce and ¼ teaspoon kosher salt. Form into 11/2-inch balls, brush with canola oil and arrange on a baking sheet. Bake at 450° for 13 minutes. Serve with Asian chile sauce.